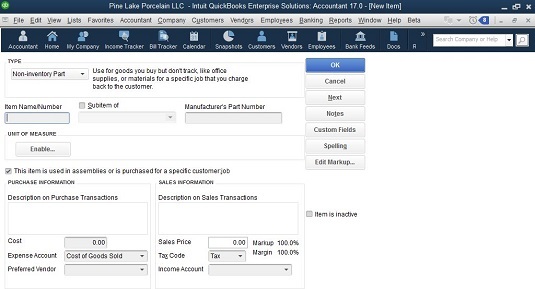 To add a noninventory part — which is a tangible good that you sell but for which you don’t track inventory — display QuickBook’s New Item window and choose Non-Inventory Part from the Type drop-down list. When QuickBooks displays the Non-Inventory Part version of the New Item window, give the noninventory part a name or code by using the Item Name/Number box. If the new item is a subitem, select the Subitem Of check box and then identify the parent item by using the Subitem Of text box. Use the Description box to provide the description that should go in invoices that bill for this noninventory part. Obviously, you enter the price in the Price box. Use the Tax Code drop-down list to identify whether the item is subject to sales tax. Finally, use the Account drop-down list to identify the income account that should be credited for sales of this noninventory part. The regular Non-Inventory Part version of the New Item window. Note the check box labeled This Item Is Used in Assemblies or Is Purchased for a Specific Customer:Job. If you select that check box, QuickBooks displays a slightly different version of the Non-Inventory Part window. This version of the window includes Purchase Information and Sales Information areas that work the same way as the Purchase Information and Sales Information areas supplied by the regular Inventory Part version of the New Item window. The kooky Non-Inventory Part version of the New Item window.